We have been listed on Jozikids.co.za!! GREAT NEWS! We are registered as an NPO! 123-700 NPO. 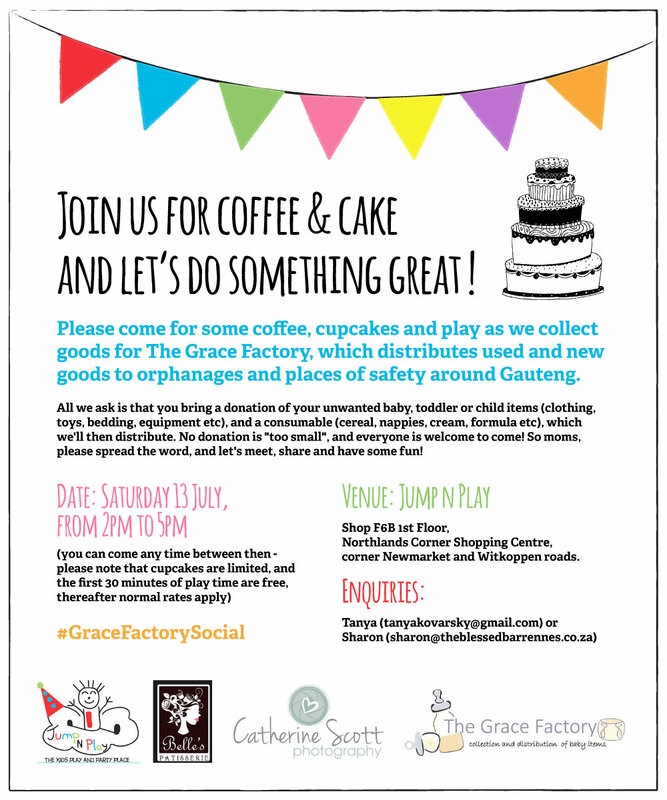 #GraceFactorySocial – 13 July 2013!!!! Thanks to EVERYONE for your amazing contributions, words cannot express our gratitude. Watch this space – We are looking at providing gift packs to mum’s in government hospitals in maternity wards. We hope that we can fill these packs with nappies, soap, baby grow, blanket, vest, bottle, bum cream, bib, face cloth. Our 17 June 2013 drop off went very well – Ethembeni Hillbrow. Our biggest drop off yet (Saturday, 11 May 2013) was so successful, THANK YOU ALL!! 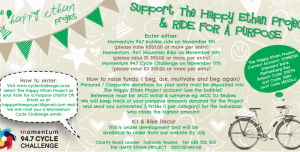 Thanks again to The Happy Ethan Project for the VERY generous donation on 01 April 2013 for Saturday’s (06 April 2013) drop off!! 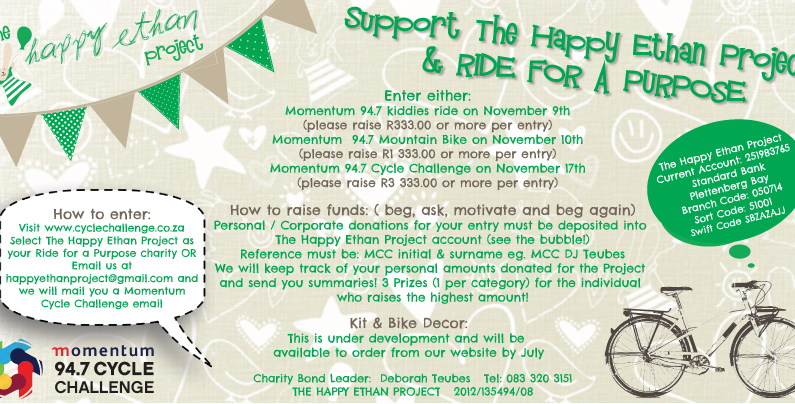 Please check out The Happy Ethan Project’s website, they are doing amazing things!! Thank you to Mark Pilgrim for his latest blog post and very kind donation of clothes. Check out Memoirs 4 my Munchkins latest blog post. Excited to announce our first donation to Howick (Natal) on Friday, 22 March 2013, to Ethembeni Ministry. We were able to help the Alex Aids Orphans project with clothes and blankets, Friday 22 March 2013. Distribution at Door of Hope (Saturday 16 March 2013) went so well! Appreciate all volunteers who helped, thank you. Check out their website. Check out The Blessed Barrenness’s blog post about The Grace Factory. Distribution at Florida Baby House (Saturday 09 March 2013) went very well. The wonderful ladies who work at this house do amazing work! Check out their website. 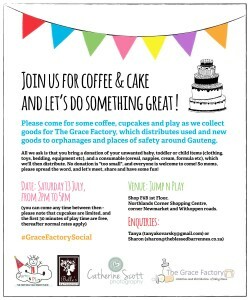 Check out Rattle and mum’s blog post on The Grace Factory. Thank you to David O’Sullivan for the wonderful interview on 702 today (Monday 4 March) and for all the exposure!! Completely overwhelmed by the amount of people who would like to help. Thank you, Thank you, Thank you!! We are very excited to announce our first collection day on Wednesday 27 February 2013 at belles and bambinos mum’s group. Thank you to everyone who contributed, it was very successful.